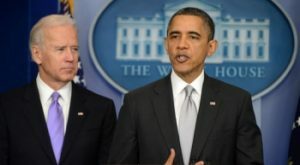 In the wake of the Newtown tragedy, President Obama called on Vice President Biden to come up with a ‘comprehensive’ plan to address gun violence and school safety. Putting aside the gun control recommendations as that would require a separate post, the school safety portion of the plan mirrors other ‘comprehensive’ plans supported by the president. These plans have helped keep the president in office but have worked out less well for everyday people. On the environment, Obama has supported modest investments in renewable energy technology, while also supporting nuclear energy and “clean” coal. He has allowed drilling in the arctic and will likely fully green-light the Keystone XL pipeline designed to bring unrefined oil from tar sands in Canada to refineries in the US. The limited promotion of renewable energy without a significant push to divest from fossil fuels is like pointing to a speed bump while flooring it over the climate cliff. On immigration, the President will soon unveil his comprehensive immigration reform (CIR) plan. It will likely include limited amnesty for a few, guest worker programs for more and lots more enforcement. Obama has already presided over record numbers of deportations, the targeting of immigration reform activists and the break-up of families across the country. CIR 1996 or CIR 1986 did not resolve the plight of immigrant communities (often here as a result of the catastrophic climate and foreign policy of the US). This latest round will not either unless there is a significant push to limit policies that would further the criminalization of immigrants. On school safety, the President’s plan calls for assisting schools in making emergency plans, providing more counselors in schools, addressing school climate and providing resources to put more police officers in schools. Numerous reports show that police in schools do not make schools safer. In predominantly low-income communities and communities of color, cops have become enforcers of school discipline rather than school safety, arresting students for talking back to teachers, profanity etc. Students shouldn’t be doing this stuff, but hauling them into court doesn’t actually get to the root of the behavior nor does it make schools safer. Finally, it drives students away from where they should be, in school. Liberal and progressive politicians and advocates are too quick to pat themselves on the back when their recommendations are included in these “grand bargains.” Obama’s “bargains” have geared government resources toward reinforcing the decimation of civil liberties since 9/11 rather than investing in the building blocks of truly safe and sustainable communities. “All of the above” is a grand bargain for business interests pushing for drilling, surveillance systems, and detention centers at the expense of people and the planet.